Genesis Networks is a leading provider of telecommunications. Founded in 2005, this dynamic company has built a brand recognized for one stop shop solutions in the telecommunication sector. They have their own facilities based network powered by Avalon Telecom. "Telecom expenses are usually the third largest expense to corporations after payroll and real estate. We help our customers reduce their costs through lower rates." 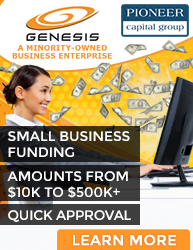 Genesis Networks operates as a minority business communications company. The company specializes in audio, web, video, and data & voice services; Internet protocol solutions; and private line transport telecom expense management and mobile satcoms. They serve enterprises, educational, and government entities. Genesis Networks is based in Knoxville, Tennessee and New Jersey. Genesis Networks has built Best-in-Class technologies along with streamlined business processes and solid ethical standards that ensure every business and residential customer receives exactly the services that Genesis Networks promised. Genesis Networks will meet or exceed your expectations with their affordable custom solutions and a consistently satisfying customer experience. To help our customers reduce their costs through lower rates, while providing a high quality teleconferencing and telecom services. Bruce Braithwaite's corporate philosophy is a business variation of the Golden Rule: "Treat your employees, customers and business associates as you would want them to treat you." Mr. Braithwaite considers it imperative that he always be reachable and available to every member of his corporate team and to all parties with whom he does business.